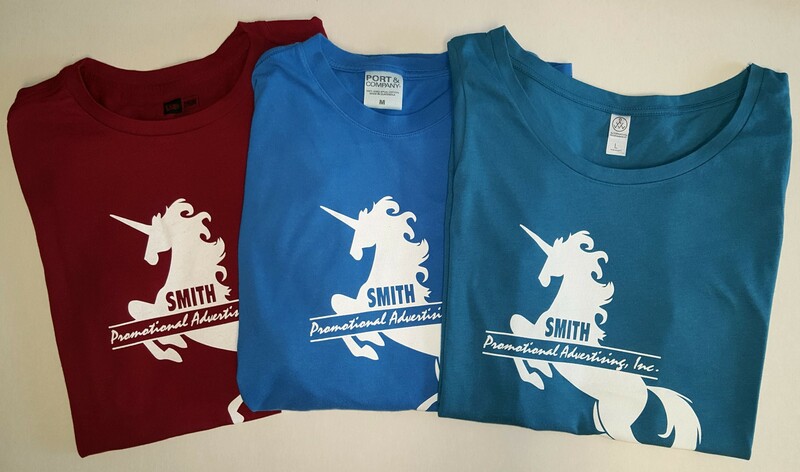 Creating the perfect custom T-Shirt for your personal, small business, corporate, team, or organizational needs is easy with Smith Promotional Advertising. Step 1: Pick a decoration method. • Screen printing (above) is the most common T-Shirt decorating method for good reasons. It’s classic, it’s economical, and it looks great. • Digital printing works well for designs that are highly detailed or include full-color images. • Heat transfers are good for individual personalization, such as team names and numbers for sports apparel. Heat transfers also come in a variety of finishes — such as glitter, metallic foil, and reflective — if you’re looking to really stand out. Step 2: Create a design. Send us your design, and we’ll take it from there. Don’t have one yet? No worries. Our talented designers are ready to help. Step 3: Choose your T-Shirt. We have something for everyone, whether you’re working on a tight budget or looking for luxury. Not sure where to start? Try this list of our favorite T-Shirts. Most of our screen printing projects are completed and delivered in two weeks or less after design is approved. Don’t have that much time? Ask us about a rush. Small project and large contract pricing is available.